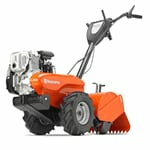 For breaking up the hardest, most compact soils, get a rear-tine tiller. These are equipped with large, rugged tires for stability to work through soils of all conditions. What separates rear tine tillers from the rest of the pack is the different tine rotation directions you can use. Unlike cultivators and front-tine tillers, rear-tine tillers are either forward (standard) rotating, counter-rotating, or dual (both) rotating. This allows them to break through hard, clay soils. Garden Tiller Buyer's Guide.. Our Power Equipment Direct how-to library can help you learn about How to Grow Crops with Raised Rows or Beds, Proposition 65 Product Labeling and Sales Tax Information.